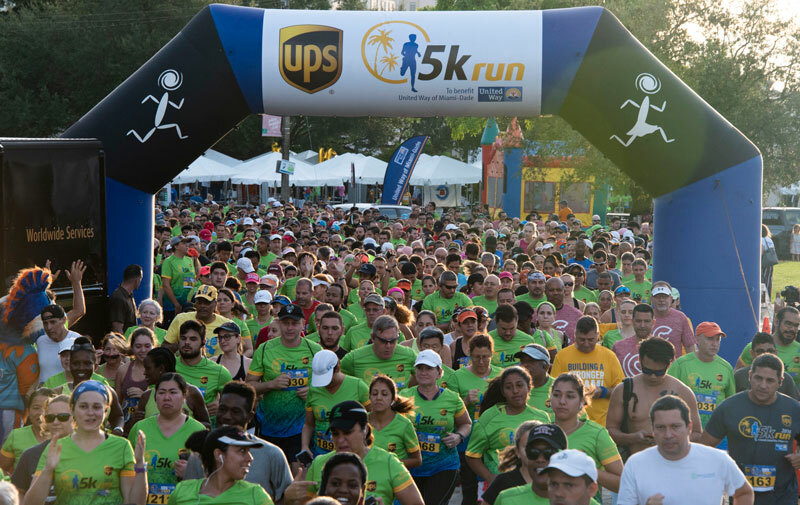 The UPS 5K Benefiting the United Way of Miami-Dade takes participants through the beautiful city of Coral Gables and will run on our new scenic course. The race still starts and ends at the City of Coral Gables Historic City Hall at a festive post-race party at Merrick Park. The park is across the street from City Hall at the intersection of Le Jeune Road and Miracle Mile. 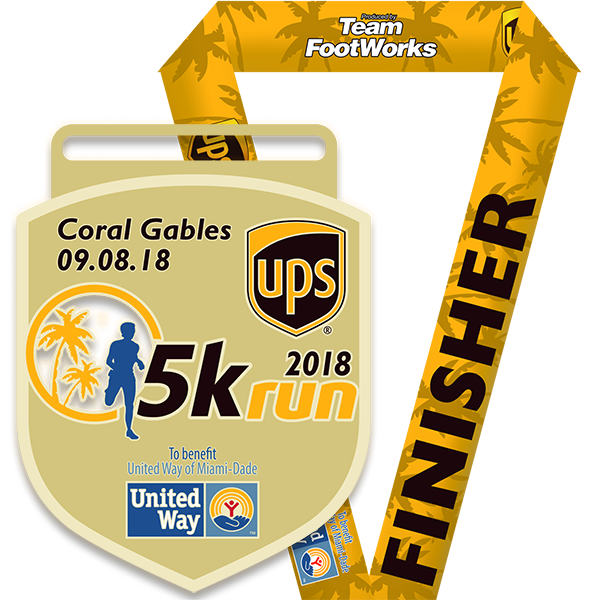 Run past the Church of the Little Flower, The Biltmore Hotel, Coral Gables Congregational, Desoto Plaza, and Venetian Pool! WANT TO CONTINUE TO HELP UNITED WAY BUILD A #STRONGERMIAMI? 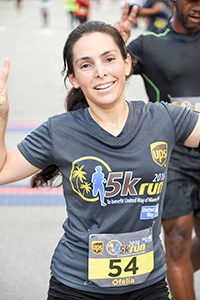 Create your own UPS 5K fundraising page! Click here to manage your Fundraising Page. Pre-race warm up, massages, music, food, and for the first the first 1,500 registrants – an awesome custom technical T-shirt. Plus finisher medals! Parking fees can be paid using the Paybyphone app. Curbside or on-street parking fees are enforced 9am to midnight. Rates range from $1.00 per hour to $2.50 per hour. Garage parking fees are enforced 24/7. The nearest garage is on Andalusia just east of Lejeune. There is a 2nd garage on Andalusia about a block further east. Epic Sports will electronically time the race. For results and event photos, please visit www.teamfootworks.org. Absolutely no exchanges, or transfers. Refunds will be given only for the reason listed in the CANCELLATION POLICY below. Temperature/humidity can be high in South Florida. Participants should drink plenty of fluids(non-alcoholic) for 48 hours prior to, during and upon finishing the race. Beware of heat-injury symptoms (Dizziness, no sweating, nausea, cramps, redness, incoherent speech and thoughts). Seek immediate assistance if symptoms occur. Wear loose, light colored clothing. Good Day. Please, I wish to obtain the results of the “Tribute to the Military 5k Race” celebrated last Sunday March 13th -2016. Thanks for your kind attention. The link to the results was posted in the Tribute to the Military 5K page. Look for the button that says 2 0 1 6 R E S U L T S.
Will there me a medal for all finishers ? Hello Giselle. This has not been decided yet. Hello, I don’t see any rules/restrictions listed but was wondering if strollers are allowed. Please advise. Strollers are allowed at all of our events. We just ask that you be considerate of other participants and start the race at the back or side so as not to impede or injure other runners and walkers. Remember you and your stroller take up more room that just a runner or walker, so please give yourself and others around you plenty of space to participate safely. Can we bring our dog to run/walk with us ? Hello Lis, Pets are not allowed. Thank you. Hello Ashley, we’re meeting with City Officials and will follow their direction. We should know more later today. Hello G! The 2018 race amenities have not been discussed yet. Yes, Marian — the 2018 event will have finisher medals. Eddie Suarez sir. Still no word of finisher medals for this race? Hello Jon and good morning! We’re looking at the budget to see if we can offer finisher medals. Hoping to have an answer in the next few days. Jon! I got confirmation that there are finisher medals!